We are! Follow us on social media to get maintenance, home improvement and green building tips as well as links to relevant housing articles and neighborhood events for the Portland area. Comments Off on Tip No. 5 | Did you know? I’m not really the type of person to toot my own horn, but this article on Faces from the Neighborhood is so well-written and deserves a read! Learn a little about my history, my fascination with crawlspaces and why I gave up architecture. If you’re looking for a realtor here in the Portland area, contact Lisa- she’ll take care of you! I changed the battery and calibrated my moisture meter this morning. I also successfully tested my skin and it contains moisture, so that’s good… but how do I use my moisture meter in a home inspection? 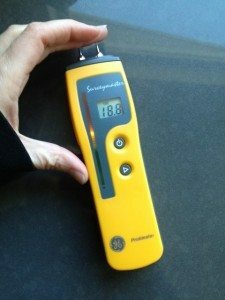 My moisture meter is an invaluable tool to have in a home inspection and I use it a lot (mostly just to be sure) but surprisingly, I don’t usually find an alarming amount moisture. (Testing wood is tricky because it naturally contains moisture.) It’s even more difficult to detect moisture during the summer months when it hasn’t rained for a while so little moisture is present from a lack of rain. If the house you’re getting inspected has had leaks or moisture issues in the past that the realtor and client know about, let me know so I can check it with my meter!